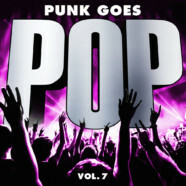 Punk goes Pop volume 7 is out and it is definitely one of my go to albums this summer. Even though I wasn’t really familiar with the songs that were chosen this time around, I can now sing right along with every single one of them. The biggest draw for me was when I saw that Dance Gavin Dance was covering “That’s What I Like” because I knew it would be fantastic and it did not disappoint. It’s one of the more fun songs on this album. Ice Nine Kills covered “I Don’t Wanna Live Forever” which I now prefer over the original version because it’s that good. State Champs covered “Stitches” and it’s another one that I now prefer over the original. The Plot in You covered “Let It Go” and it gave me chills. Landon Tewers has one of the most amazing voices. Lastly, The Amity Affliction covered “Can’t Feel My Face”. The vocals are perfect and the whole song is a lot of fun. Overall this is a solid jam album- even if you’re like me and don’t necessarily know all of the songs. I’ve always enjoyed how fun these albums are and I always thought the song selections were most times perfect for the bands doing them. This time around every song worked perfectly for every band. Volume 7 is now up there in my favorites of the Punk Goes series.